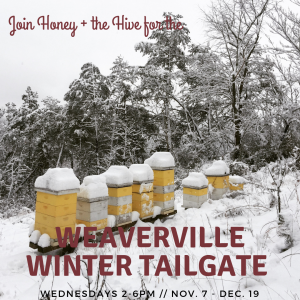 Tomorrow kicks off the Weaverville Winter Tailgate Market! We are excited to host the market at our storefront. Stop on by for fresh produce, local meats and dairy, baked goods, arts and crafts, and more! The market runs from 2-6pm on Wednesdays from now through December 19th. While you’re at it, mark your calendars for our Holiday Market on December 8th and 9th! A great way to support local artists, crafters, and businesses.